When you are pressed for time during the week the last thing you want to do is spend even more hours in the kitchen preparing, cooking, and cleaning up dinner. Comforting casserole recipes are the perfect answer for simple weeknight dinners and are the ultimate comfort food. When you utilize chicken you have already batch cooked, your precious time in the evening can be cut in half. Make things even easier by grabbing a rotisserie chicken from the store. Either option will work perfectly in this zesty casserole dish. A healthy, homemade dinner doesn’t have to be complicated. Whether you utilize your slow-cooker or make casserole recipes, keep things simple. Often times on a ketogenic diet, people tend to overthink their meals. When you first start on with this way of eating, don’t be afraid to utilize store bought items like a rotisserie chicken or even canned enchilada sauce. These days there are so many healthy options readily available at your local supermarket that will help make your life even easier. 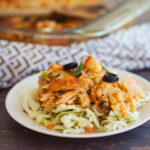 You won’t miss the traditional beans and tortillas at all because this chicken casserole is packed with the perfect amount of zesty Mexican flavor and cheesy goodness. No need for those extra carbs from the starches that can kick you out of ketosis. Instead you will be filling up on a big helping of a very unique and beneficial vegetable- cauliflower. Cauliflower is rich in a variety of compounds that help your body cleanse itself. They help aid in the digestive process, detoxify the body against harmful oxidative stress, and aid in nutrient absorption. The cauliflower in this casserole will also provide a nice helping of fiber that can protect your stomach lining and prevent bacterial overgrowth. This fat soluble vitamin helps keep bones healthy and helps prevent bone loss which can lead to osteoporosis. The Vitamin K and Vitamin D found in the cauliflower used in this chicken recipe work together to help improve bone density. These unique compounds provide your cells with a natural way of defending itself from harmful everyday exposures, oxidative stress and free radicals. Cauliflower is also rich in Vitamin C which helps reduce inflammation, boost immunity, and reduces the chances of harmful bacteria and infections. So many nutritional benefits in one simple and easy casserole. Instead of loading up on those empty carbs that may leave you feeling less than satisfied, fill up on a powerhouse of nutrients in this tex-mex chicken enchilada casserole dish. Use this as a main dish or side dish and serve alongside a nice green salad. If you aren’t a fan of chicken or perhaps need a bit more healthy fat, swap it out for ground beef. Preheat oven to 375 degrees F and coat a baking dish or 8×8 deep dish with non stick spray or butter. Add enchilada sauce, egg, seasoning, spices, and mayonnaise to a large bowl. Whisk well until smooth. Add in pre-cooked chicken and cauliflower. Toss to coat. Stir in Monterrey jack cheese. Top with additional cheese, olives, green onion, and extra sauce if desired. Bake for 55-60 minutes until top is bubbly, golden brown, and cauliflower is tender. the instructions don’t mention where and when to add the cauliflower? Hi Darlene, thanks for pointing this out. We have updated the recipe. Cauliflower is added along with the pre-cooked chicken.